It is with the greatest of pleasure today that we can finally announce that The Hundred Club, Souls in Action and MMIBTY.com have teamed up to get Yolanda Be Cool to Denver’s own NORAD Dance Bar on friday August 9th. We at MMIBTY couldn’t be more excited to begin assisting The Hundred and Souls in Action with their awesomely popular monthly “Home” Series going down every Friday night. Each month we will work along with SIA and The Hundred to help promote one of four different monthly ‘Home Friday’ events, so stay tuned to the CO Shows Page as we continue to roll out the lineups. Along with Yolanda will be british house sensation Kidnap Kid and a slew of the best Denver has to offer in local EDM production including; Option4, Keepers, and Uncle Buck. 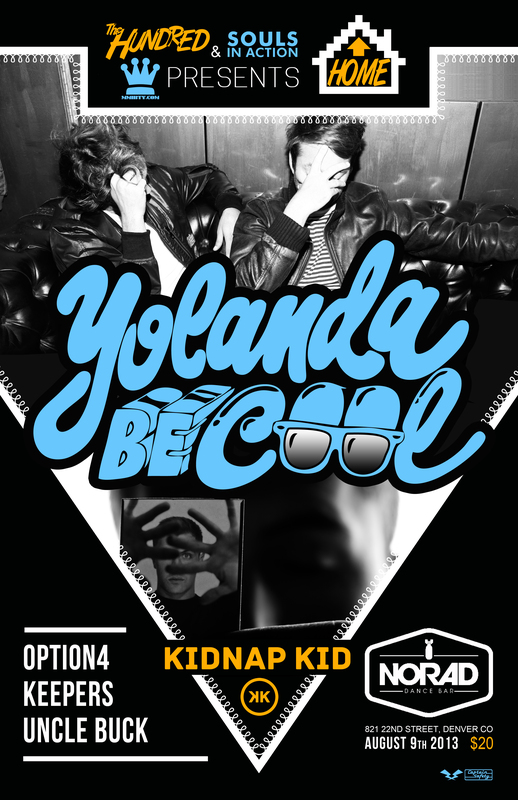 Below are the newest mixes from Yolanda Be Cool and Kidnap Kid, each is a great hour of house driven tunes that truly display the talent that both Yolanda and Kidnap have. Also this one is going to sell out, so be sure to get out there early and catch Option4, Keepers, and Uncle Buck as they get the night started with their usual funky, deep, ghetto, and tech house shenanigans. Once again we want to remind you to grab TICKETS to this show as soon as possible because this will be a packed house August 9th and we want to make sure to see all your gorgeous smiling faces out there on the dance floor with us! TICKETS & EVENT INFO HERE.